This threshold process is governed primarily by statute 41 U.S.C. 1908, which requires mandatory review and adjustment of certain statutory acquisition-related thresholds for inflation using the Consumer Price Index (CPI), specifically the index for urban consumers. These adjustments are calculated and updated in the Federal Acquisition Regulation (FAR) in every fifth year that is evenly divisible by five (2000, 2005, 2010, 2015, etc). For consistency the Government follows this process for all thresholds, not just 41 U.S.C 1908. Once the adjustments are calculated, the threshold numbers are updated line-by-line throughout the FAR. If the process is this bland and esoteric, what are these “huge differences” that we were talking about? For a more common example, let's imagine a Federal law that required the highway department to change every speed limit on every street once every five years. That process would also be bland and esoteric…unless there were blue lights flashing in the rear-view mirror. 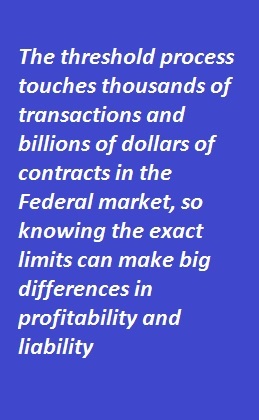 The threshold process touches thousands of transactions and billions of dollars of contracts in the Federal market, so knowing the exact limits can make big differences in profitability and liability . In the 2015 round of threshold changes the best illustration of the process is the Simplified Acquisition Threshold (SAT), which did not change at all. The SAT is also a very critical item for the small business community, where an adjustment of zero should be a big headline. The SAT is important because it defines the lower boundary of complexity in Federal contracting: complexity in the application of the law, the application of the regulations, and the internal procedures imposed on the Government buyers. The expenditures under the threshold total about 4% of Federal acquisition spend annually. If this sounds small, don't forget that the multiplier is a total Federal spend of $350M, so that a small fraction is a big number: $14B. The number is even more significant to small business because these transactions are reserved for small businesses (FAR 13.003). 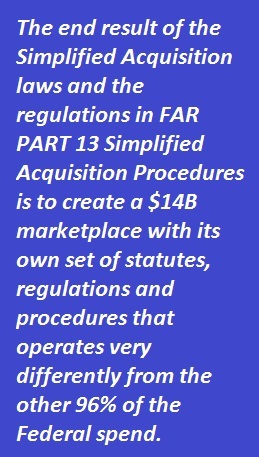 The end result of the Simplified Acquisition laws and the regulations in FAR PART 13 Simplified Acquisition Procedures is to create a $14B marketplace with its own set of statutes, regulations and procedures that operates very differently from the other 96% of the Federal spend.  The Simplified Acquisition statutes are different . Above the threshold, every Federal acquisition law is fully applicable. Below the threshold, there are seven major statutes (including the requirements for Audits and Records) that do not apply.  The Simplified Acquisition Procedures regulations (FAR Part 13) are simplified in fact, not just in name. Above the threshold, the full menu of FAR Part 52 clauses comes into play, with more than fifty government-unique clauses potentially applicable to even the simplest FAR Part 12 commercial transaction. Below the threshold, FAR Part 13 Simplified Acquisition Procedures is the governing regulation. The FAR Part 13 menu of terms and conditions is shorter, especially in the areas of reporting requirements and subcontracting. The terms are also tailored to a small business environment (e.g. FAR 52.232-40 Providing Accelerated Payments to Small Business Subcontractors).  The key word is procedures . This is the most critical factor in the SAT marketplace. The FAR Part 13 procedures operate on quotations, not full-blown bids and proposals. Oral quotations are permissible. The competition rules are streamlined. More importantly, the internal government process is streamlined, without the need for program offices, project teams, detailed reporting, and the other process steps that affect FAR Parts 12 and 15. All of the thresholds are reviewed every fifth year to coincide with the anniversaries dictated by 41 U.S.C. 1908, but not all of the thresholds are listed in that statute, nor are all the thresholds calculated on the same formula. The FAR Council practice of reviewing and adjusting all thresholds at the same time on the five-year anniversary provides consistency and predictability in the process, but not in the results. For example, the Cost or Pricing threshold, which is the foundation for FAR Part 15 Contracting by Negotiation, is governed by different statutes (10 U.S.C. 2306a and 41 U.S.C. 254b) and floats upward with CPI. Since 1995 the calculation has yielded a Cost or Pricing threshold adjustment within decimals of the CPI in all four of the adjustment cycles. SAT does not work that way, because the statute requires that after the CPI calculation for SAT is applied, the index is rounded downward according to statutory criteria. This means that in the current environment of relatively stable CPI, the rate of inflation is insufficient to overcome the rounding requirements. Thus, while the Cost or Pricing thresholds that govern the high-value high-profile procurements have increased four times since 1995, SAT has only been adjusted once (2010). We should repeat again, for absolute clarity, that this is not a matter of policy or discretion or active decisions within the Government. This is the statutory formula that was built into the law two decades ago. The result of the formula is that while the other 96% of Federal transactions keep pace with the market, the low-dollar SAT transactions, and the small businesses that operate in that market, get left behind. In real-dollars, the SAT market actually shrinks during the time lags between statutory adjustments. Between 1995 and the first (and only) SAT adjustment in 2010, the CPI index grew by 44%, while the SAT was unchanged during those fifteen years. During this FY95-FY00 period, in constant dollars, the original threshold of $100,000 shrank to $69,000 in terms of real buying power. When the formula yielded an adjustment in 2010, the increase brought SAP level with CPI as of that moment. Immediately the process restarted with CPI continuing to rise against the fixed SAT. As of 2015, the current $150,000 threshold is actually worth $139,000 in FY10 buying power. This erosion will continue until the SAT exceeds the rounding formula and qualifies for an adjustment. The earliest date for update would be 2020, but at the current rate of inflation, the more likely forecast would be a 2025 update. The 2025 prediction is based on the current threshold and the current formula. The House of Representative version of the National Defense Authorization Act for FY2016 (NDAA) includes a provision to strike the original threshold and replace it with a $500,000 threshold. The five-year review process and formulas would remain the same, but starting from the new $500,000 baseline. If enacted this would significantly increase the size of the SAT marketplace in both numbers of eligible transactions and dollar volumes, providing more opportunities for small business. The NDAA is currently in House-Senate conference, so the potential of this provision becoming law is difficult to assess, but important to watch as the legislative process unfolds. Don't break down under pressure: There is no recourse when a procurement falls on the complex side of the border, even by a few dollars, because FAR 13.003(c)(2) precludes the breakdown of requirements aggregating more than the simplified acquisition threshold merely to permit use of simplified procedures or to avoid particular requirements that apply above the threshold. There is no such thing as a Bundle of Joy: Combining requirements for economies of scale or aggregating volumes for better discounts (“bundling”) will not pay off for the buyer if the new combination pushes the procurement across the border from the Simplified Acquisition Procedures world of oral quotations and simple competitions into the FAR 15 universe of formalized planning, multi-function teams, and complex written reports. Keeping it simple really does work for both buyer and seller when FAR Part 13 is properly applied. Beware the hybrid procurement: FAR Part 13 is simplified for several reasons, all spelled out in the regulation: a) reduce administrative costs, b) improve opportunities for small business, c) promote efficiency and economy in contracting, and d) avoid unnecessary burdens for agencies and contractors. None of these are served by interjecting language or clauses from FAR 12 or FAR 15 in the name of making improvements or protecting the interest of the Government. The key word in Simplified Acquisition is “Simple”. Both Government buyers and small business sellers should work to keep it that way.